After about an hour's drive home (most of the goats were off the roads when the sun went all the way down! )...we got back to the hotel at around 10:00 P.M. - making for a very, very long day!! It was far too late to go out to eat, so - The Bee and I just crashed.... We woke up pretty early and went out for a walk around the hotel neighborhood... There was a petrol station right next-door to the hotel, and a dirt lot behind it...so - that was the first place we headed for her morning trip to the "ladies room". There was a school and a small park...and the city was just beginning to awaken. It's amazing how much excitement a little black Lhasa Apso can cause!! Everybody stops to stare at us...and to point at Beloved and smile. There are innumerable street dogs in India...but the sight of a little black fur-ball on a flexi-leash is just too comical for most people! 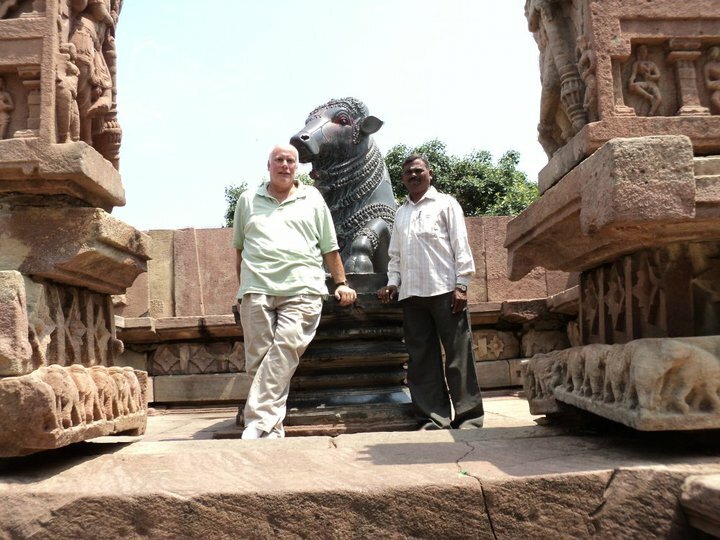 At around 10:00 A.M., Bhaskar (see photo of me and Bhaskar - with Nandi, the Bull, above) and Prabhakar rang my hotel room doorbell and we made our way downstairs with Krishna and the bags...I was ready to go, because breakfast came with the room - - but all I had was three cups of strong/sweet coffee! I already knew better than to ask Bhaskar how :far" it was to Ramappa Temple - so I asked him "how long was it going to take?" He told me it was going to be a two-hour drive...and - that's exactly how long it took. Ramappa Temple, constructed in the typical architectural style of South India during the Kaktiya rule in the 12th century, is truly a grand old temple dedicated to Lord Shiva in a town called Palampet not far way from Mulugu, which is outside of Warangal. This temple is revered very much by the Hindu community and is assumed to be the great contribution of the Kakatiya Kings. Ramappa Temple, placed in a star shaped platform 6 feet high, has a Shivalingam in the inner-sanctum with a sikhara at the mount. A mandapam with a Nandi Idol that stands about nine-foot high, in ruins now, placed at the entrance and many small shrines are placed around the main temple. The temple walls are decorated with impressive carvings, which display epic stories of Ramayana and Mahabharata. The major festival celebrated here is Shivarathri and which day devotees still throng to this temple. It may be in ruins - but it is very much a working, active temple. Generally, temples are named after the person who built them or the deity in that temple, but Ramappa temple was named after the sculptor Ramappa. Inside the temple, (which is under a bit of renovation and has much wood scaffolding on the outside, so you have to enter the temple crossing the west side wall)... there are signboards installed by Archaeological Survey of India to describe the temple's importance. After spending some time absorbing the signs, we walked to our left ...and there was was the Ranga Mantapam (also called the Natya Mantapam). In the place between Inner temple and Ranga Mantapam, there is a small room which gives space for about ten people. After paying 200 rupees for the three of us (that's about four-dollars...and, yeah...Krishna stayed and watched Beloved!) - it was at this place where a Shiva pujari did for us a special ceremony known as Rudreswara's (Siva Lingam) Darshanam. I think the priest was there every day and did this for tourists and pilgrims...but - on this day - we were the ONLY people there...the beauty of being able to travel mid-week!! Similar to the pooja the prior evening (only without the drums!!) - it was a very nice ceremony. This room space where we were standing is called the Antharalam. There was blackstone wall dividing Antharali and Natya Mantapam. To the left of Antharalam, there is a screen on which carvings are made which are 1,000-years-old and still quite stunning! Walking outside was the biggest thrill of the day for me....all along the eaves of the temple, climbing all along the scaffolding and the exterior walls....was a virtual highway for the Ramappa Temple monkeys !!! Literally hundreds of monkeys.... and they are pretty big ones, too!! They have red butts like baboons (sorry - I know...TMI - but - they do!!) - they are cute...but I kept my distance because several of the mama monkeys had babies with them and - these monkeys have some serious-looking teeth!! There are photos of some of the monkeys and the Ramappa Temple on my Facebook Photo Album page. We spent a good long time at the temple....it was really humid...and - as much as I'd like to say that I am totally used to the Indian climate...I was soaked with sweat by the time we headed for the car. I jokingly told Krishna when we got back to the car that I spend good money to use the steam-room at Latitudes Pro Gym...and here in Ramappa, I get to sweat more....for free!! It was time to head home...so - - we stopped for a nice lunch at one of the Warangal hotels (great chicken curry and vegetable curry with rice and hot butter-naan!) - - we dropped off our new friends (I think they expected that we'd see more temples...but - we really did need to go so we didn't hit terrible traffic in Secunderabad...we DID hit the traffic...but I was so ready to go home...and so was The Bee!! We made a leisurely drive home...stopping a few times to look at small temples on the way...and we got home around 8:00 P.M. Overall - - for a first try...our Warangal Road Trip was incredibly worthwhile and a real treat!! Thanks to Vivek and Bhaskar Prabhakar for all the wonderful advice and sightseeing help! Next Blog Coming Soon - - Road Trip Number Two: "Srisailam"!! 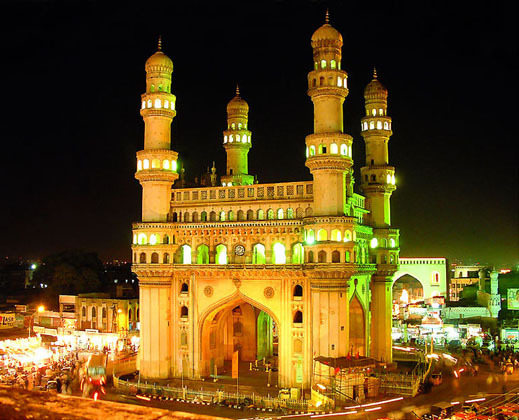 Your travelogue is really awesome.By reading your travelogue i feel that i should also travel to different places and explore the beauty of the places.Thank you for sharing the wonderful information.Book tickets in Meghana Travels to travel to Hyderabad.